I had one last look at my temperature gauge, -2°C. 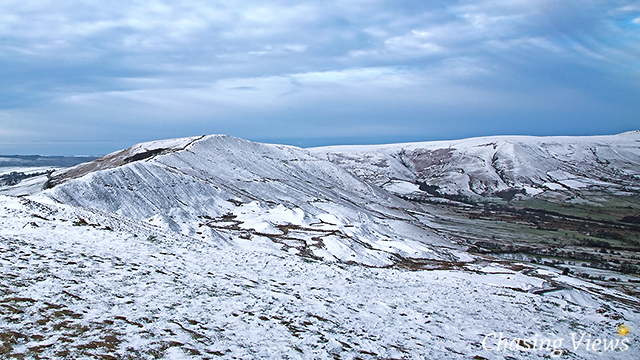 After getting wrapped up warm and sampling a nice cupper, I started the steep, but short walk up Mam Tor. 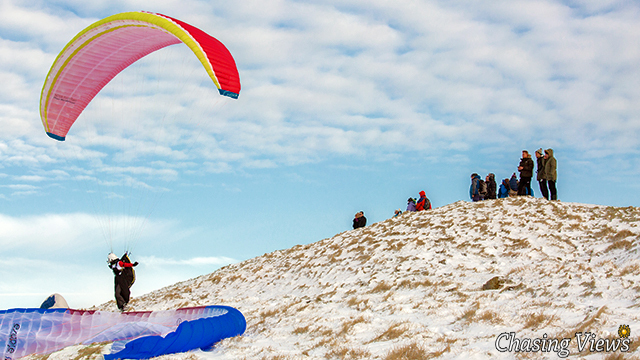 The first thing I noticed was lots of people paragliding from just beneath the summit. Time to get my camera out! 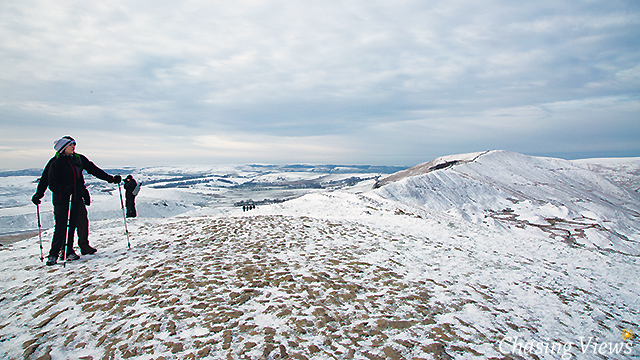 After capturing a few photos I made my way up to the Mam Tor summit, it’s not a particularly high peak compared to others in The Peak District. 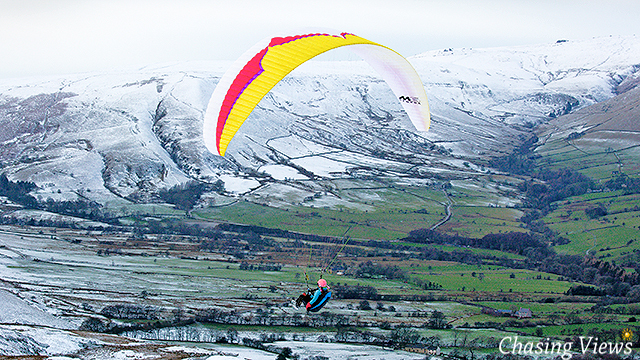 Mam Tor is 517 m (1,696 ft). 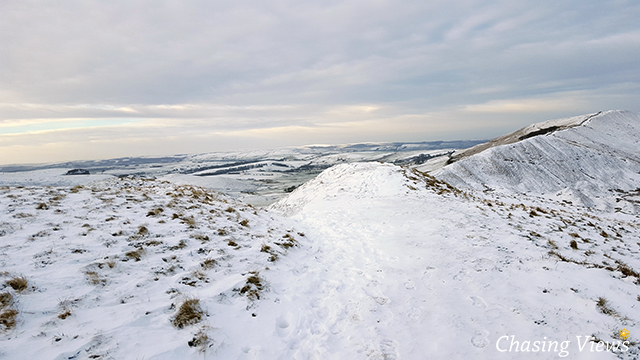 After reaching the summit of Mam Tor, I noticed that the small crowd had dispersed. 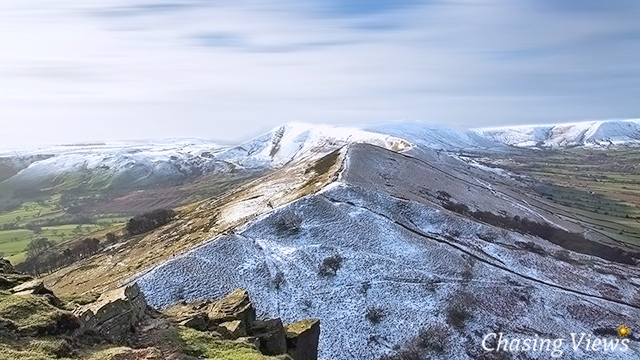 This gave me time to take in the glorious views of Edale to the North, and Hope Valley to the South. 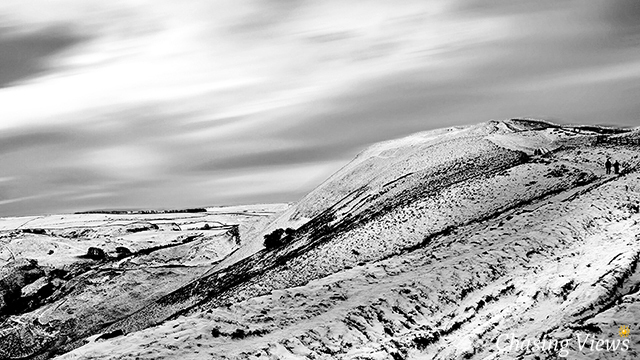 It also gave me chance to take a photo of Mam Tor summit. 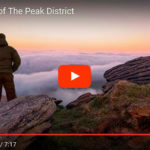 After taking in the beautiful views of Hope Valley, Edale, and the snow topped Kinder Scout in the distance, I decided to take my fist step towards the Great Ridge. 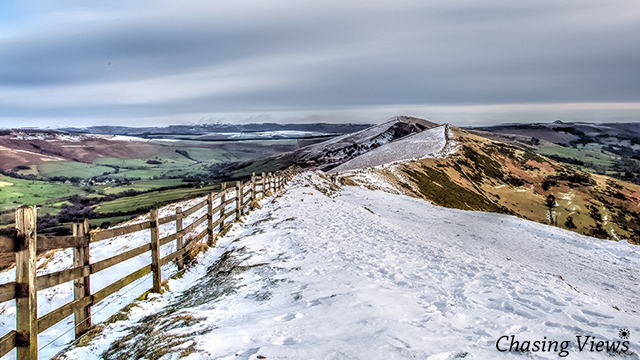 I had been looking forward to the Mam Tor and Great Ridge Walk. I was so pleased the peaks were snow-topped. 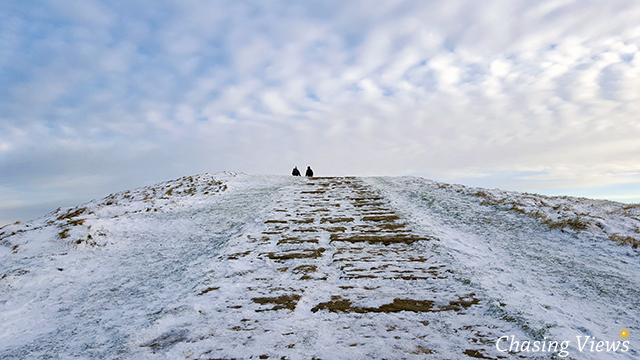 It looked so still and peaceful, and although the path was barely recognisable because of the snow, a well maintained wooden fence led the way to the next landmark in the distance, Hollins Cross. As I headed towards Hollins Cross, I felt like I was a million miles away from home. The only noise I could hear was my boots crunching in the snow every step of the way. After walking for around 20 minutes, I eventually arrived at my next landmark. 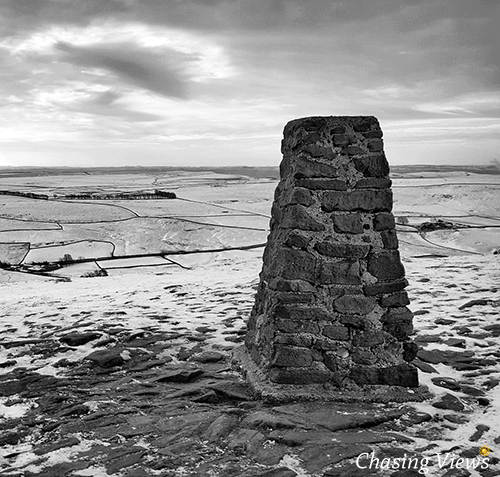 Hollins Cross is the lowest point on the ridge that provides access to both Edale and Hope Valley. 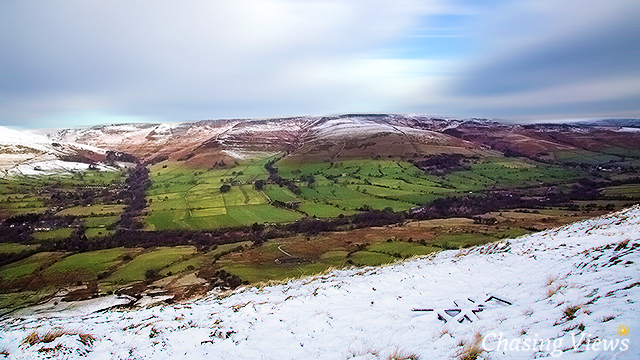 It was also the traditional route from Castleton to Edale. The view was amazing. 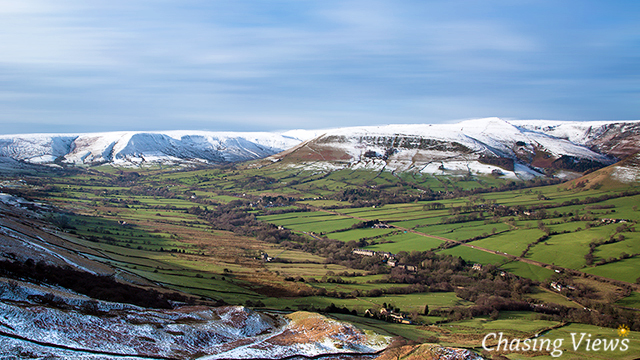 The distant mist had thinned out giving me a clearer view over Edale. 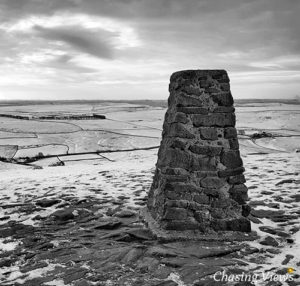 I was loving the Mam Tor and Great Ridge Walk. Time to get my camera out! 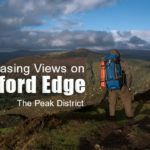 Having spent the last 30 minutes admiring the view on both sides of Hollins Cross, it was time to continue my walk on The Great Ridge and head towards Back Tor – Grid Ref: SK 19763 90993. 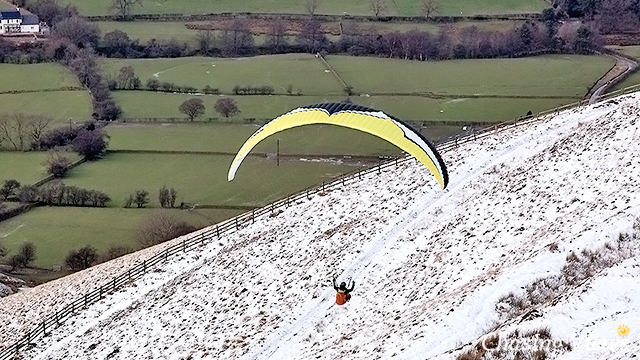 Although Back Tor isn’t a huge climb (538m / 1765ft) I was eager to see the view of The Great Ridge and Mam Tor from a reverse angle. After a short slog I reached the peak of Back Tor and headed towards a large rock that looked ideal to sit down and enjoy the views. Time for a brew and a spot of photography. 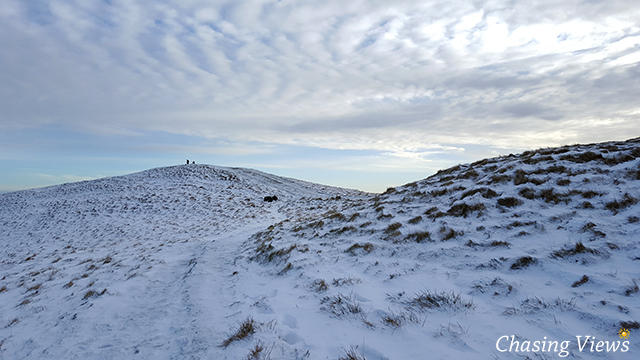 After spending a enjoyable half an hour on Back Tor, I couldn’t make up my mind whether to continue my walk along The Great Ridge to Loose Hill, or turn around and retrace my steps back towards Mam Tor. 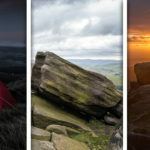 After much thought, I decided to finish my walk by retracing my steps and take in the glorious views of Hope Valley, and Edale. Overall, a fantastic adventure which I will definitely be doing again in the near future. Maybe even a wild camp on Lose Hill. Watch this space! I’ll leave you with some photographs I captured throughout the day. Notice the change in the Sky. Thanks for viewing. Please feel free to share this page via any of the social media button below!